Germany has called for higher environmental standards on farms after free-range eggs were found to contain the cancer causing chemical dioxin. Eggs with high dioxin levels were found in several German states because hens were allowed to roam on land contaminated with the chemicals. The German Agriculture Minister Renate Kuenast has called for tighter controls on free range eggs. "We must have a firmer environmental policy," she told the Berliner Zeitung. "We need to ensure that dioxin levels are reduced and that it vanishes from our environment." German consumers are worried by media reports that expensive organic eggs from free range hens are more likely to be contaminated. 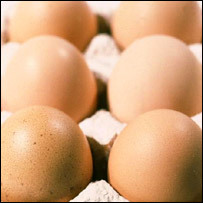 Checks in several states have shown that free-range eggs contain higher dioxin levels than battery eggs. In Lower Saxony state, 28% of all free-range eggs produced in the last two years were above European Union limits for dioxin levels, one report claimed. Thomas Isenberg of the National Association of Consumer Advice Centres has called for all eggs with high dioxin levels to be removed from the market. However he stressed that there is no need to panic. "Keep on eating your eggs for breakfast, there is no acute danger to health," he told the Dutch newspaper Expatica.